Denver recorded and released approximately 300 songs, about 200 of which he composed, with total sales of over 33 million records worldwide. He recorded and performed primarily with an acoustic guitar and sang about his joy in nature, his disdain for city life, his enthusiasm for music, and his relationship trials. Denver's music appeared on a variety of charts, including country music, the Billboard Hot 100, and adult contemporary, in all earning 12 gold and four platinum albums with his signature songs "Take Me Home, Country Roads", "Annie's Song", "Rocky Mountain High", "Calypso", "Thank God I'm a Country Boy", and "Sunshine on My Shoulders". Henry John Deutschendorf Jr. was born in Roswell, New Mexico, to Captain (later LTC) Henry John "Dutch" Deutschendorf, a United States Army Air Forces pilot stationed at Roswell AAF and his wife, Erma Louise (Swope). Years later, as a Lieutenant Colonel in the U.S. Air Force, Deutschendorf Sr. would set three speed records in the B-58 Hustler bomber and earn a place in the Air Force Hall of Fame. He met and married his "Oklahoma Sweetheart". In his autobiography, Take Me Home, Denver described his life as the eldest son of a family shaped by a stern father who could not show his love for his children. Because Denver's father was in the military and his family moved often, it was difficult for him to make friends and fit in with other children of his own age. Constantly being the new kid was troubling for the introverted Denver, and he grew up always feeling as though he should be somewhere else, but never knowing where that "right" place was. While the family was stationed at Davis-Monthan AFB in Tucson, Arizona, Denver was a member of the Tucson Arizona Boys Chorus for two years. Denver was happy living in Tucson, but his father was then transferred to Maxwell AFB in Montgomery, Alabama, then in the midst of the Montgomery boycotts. The family later moved to Carswell AFB in Fort Worth, Texas, where Denver graduated from Arlington Heights High School. Fort Worth was a distressing experience for Denver, and in his third year of high school, he drove his father's car to California to visit family friends and begin his music career. However, his father flew to California in a friend's jet to retrieve him, and Denver reluctantly returned to complete his schooling. At the age of 11, Denver received an acoustic guitar from his grandmother. He learned to play well enough to perform at local clubs by the time he was in college. He adopted the surname "Denver" after the capital of his favorite state, Colorado. He decided to change his name when Randy Sparks, founder of The New Christy Minstrels, suggested that "Deutschendorf" would not fit comfortably on a marquee. Denver attended Texas Tech University in Lubbock and sang in a folk-music group called "The Alpine Trio" while pursuing architectural studies. He was also a member of the Delta Tau Delta Fraternity. Denver dropped out of the Texas Tech School of Engineering in 1963 and moved to Los Angeles, where he sang in folk clubs. In 1965, Denver joined the Mitchell Trio, replacing founder Chad Mitchell. After more personnel changes, the trio later became known as "Denver, Boise, and Johnson" (John Denver, David Boise, and Michael Johnson). In 1969, Denver abandoned the band life to pursue a solo career and released his first album for RCA Records, Rhymes & Reasons. Two years prior, Denver had made a self-produced demo recording of some of the songs he played at his concerts. He included in the demo a song he had written called "Babe, I Hate to Go", later renamed "Leaving on a Jet Plane". Denver made several copies and gave them out as presents for Christmas. Producer Milt Okun, who produced records for the Mitchell Trio and the high-profile folk group Peter, Paul and Mary, had become Denver's producer as well. Okun brought the unreleased "Jet Plane" song to Peter, Paul and Mary. Their version of the song hit number one on the Billboard Hot 100. Denver's composition also made it to the U.K. No. 2 spot in February 1970, having also made No. 1 on the U.S. Cash Box chart in December 1969. Although RCA did not actively promote Rhymes & Reasons with a tour, Denver himself embarked on an impromptu supporting tour throughout the Midwest, stopping at towns and cities as the fashion took him, offering to play free concerts at local venues. When he was successful in persuading a school, college, American Legion hall, or local coffee house to let him play, he would spend a day or so distributing posters in the town and could usually be counted upon to show up at the local radio station, guitar in hand, offering himself for an interview. With his foot in the door as author of "Leaving on a Jet Plane", he was often successful in gaining some valuable promotional airtime, usually featuring one or two songs performed live. Some venues would let him play for the "door"; others restricted him to selling copies of the album at intermission and after the show. After several months of this constant low-key touring schedule, however, he had sold enough albums to persuade RCA to take a chance on extending his recording contract. He had also built a sizable and solid fan base, many of whom remained loyal throughout his career. Denver recorded two more albums in 1970, Take Me to Tomorrow and Whose Garden Was This, including a mix of songs he had written and cover versions of other artists' compositions. His next album, Poems, Prayers, and Promises (released in 1971), was a breakthrough for him in the U.S., thanks in part to the single "Take Me Home, Country Roads", which went to No. 2 on the Billboard charts despite the first pressings of the track being distorted. Its success was due in part to the efforts of his new manager, future Hollywood producer Jerry Weintraub, who signed Denver in 1970. Weintraub insisted on a re-issue of the track and began a radio-airplay campaign that started in Denver, Colorado. Denver's career flourished from then on, and he had a series of hits over the next four years. In 1972, Denver scored his first Top Ten album with Rocky Mountain High, with its title track reaching the Top Ten in 1973. Between 1974 and 1975, Denver experienced an impressive chart dominance, with a string of four No. 1 songs ("Sunshine on My Shoulders", "Annie's Song", "Thank God I'm a Country Boy", and "I'm Sorry") and three No. 1 albums (John Denver's Greatest Hits, Back Home Again, and Windsong). In the 1970s, Denver's onstage appearance included long blond hair and "granny" glasses. His embroidered shirts emblazoned with images commonly associated with the American West were created by the designer & appliqué artist Anna Zapp. His manager, Jerry Weintraub, insisted on a significant number of television appearances, including a series of half-hour shows in the United Kingdom, despite Denver's protests at the time, "I've had no success in Britain...I mean none." Weintraub explained to Maureen Orth of Newsweek in December 1976, "I knew the critics would never go for John. I had to get him to the people." His live concert special, An Evening with John Denver, won the 1974–1975 Emmy for Outstanding Special, Comedy-Variety or Music. When Denver ended his business relationship[when?] because of Weintraub's focus on other projects, Weintraub threw Denver out of his office and accused him of Nazism. Denver would later tell Arthur Tobier, when the latter transcribed his autobiography, "I'd bend my principles to support something he wanted of me. And of course, every time you bend your principles – whether because you don't want to worry about it, or because you're afraid to stand up for fear of what you might lose – you sell your soul to the devil." Denver was also a guest star on The Muppet Show, the beginning of the lifelong friendship between Denver and Jim Henson that spawned two Christmas television specials with the Muppets. He also tried acting, appearing in "The Colorado Cattle Caper" episode of the McCloud television movie on February 24, 1974, and starring in the 1977 film Oh, God! opposite George Burns. Denver hosted the Grammy Awards five times in the 1970s and 1980s, and guest-hosted The Tonight Show on multiple occasions. In 1975, Denver was awarded the Country Music Association's Entertainer of the Year award. At the ceremony, the outgoing Entertainer of the Year, Charlie Rich, presented the award to his successor, but in protest of what he considered the inappropriateness of Denver's selection, Rich set fire to the envelope containing the official notification of the award. However, Denver's music was defended by country singer Kathy Mattea, who told Alanna Nash of Entertainment Weekly, "A lot of people write him off as lightweight, but he articulated a kind of optimism, and he brought acoustic music to the forefront, bridging folk, pop, and country in a fresh way...People forget how huge he was worldwide." In 1977, Denver co-founded The Hunger Project with Werner Erhard and Robert W. Fuller. He served for many years and supported the organization until his death. Denver was also appointed by President Jimmy Carter to serve on the President's Commission on World Hunger, writing the song "I Want to Live" as its theme song. In 1979, Denver performed "Rhymes & Reasons" at the Music for UNICEF Concert. Royalties from the concert performances were donated to UNICEF. His father taught him to fly in the mid-1970s, which led to a reconciliation between father and son. In 1980, Denver and his father, by then a lieutenant colonel, co-hosted an award-winning television special, The Higher We Fly: The History of Flight. It won the Osborn Award from the Aviation/Space Writers' Association, and was honored by the Houston Film Festival. In the mid-1970s, Denver became outspoken in politics. He expressed his ecologic interests in the epic 1975 song "Calypso," which is an ode to the eponymous exploration ship and team of environmental activist Jacques Cousteau. In 1976, he campaigned for Jimmy Carter, who became a close friend and ally. Denver was a supporter of the Democratic Party and of a number of charitable causes for the environmental movement, the homeless, the poor, the hungry, and the African AIDS crisis. He founded the charitable Windstar Foundation in 1976, to promote sustainable living. His dismay at the Chernobyl disaster led to precedent-setting concerts in parts of communist Asia and Europe. During the 1980s, Denver was critical of the Reagan administration, but he remained active in his campaign against hunger, for which Reagan awarded Denver the Presidential World Without Hunger Award in 1987. Denver's criticism of the conservative politics of the 1980s was expressed in his autobiographical folk-rock ballad "Let Us Begin (What Are We Making Weapons For?)". In an open letter to the media, he wrote that he opposed oil drilling in the Arctic National Wildlife Refuge. Denver had battled to expand the refuge in the 1980s, and he praised President Bill Clinton for his opposition to the proposed drilling. The letter, which he wrote in the midst of the 1996 presidential election, was one of the last he ever wrote. Denver was also on the Board of Governors of the National Space Society for many years. Denver had a few more U.S. Top 30 hits as the 1970s ended, but nothing to match his earlier success. He began to focus more on humanitarian and sustainability causes, focusing extensively on conservation projects. He made public expression of his acquaintances and friendships with ecological design researchers such as Richard Buckminster Fuller (about whom he wrote and composed "What One Man Can Do") and Amory Lovins, from whom he said he learned much. He also founded the environmental group Plant-It 2020 (originally Plant-It 2000). Denver had a keen interest in solutions to world hunger. He visited Africa during the 1980s to witness first-hand the suffering caused by starvation and to work with African leaders toward solutions. From 1973 to at least 1979, Denver annually performed at the yearly fundraising picnic for the Aspen Camp School for the Deaf, raising half of the camp's annual operating budget. During the Aspen Valley Hospital's 1979, $1.7 million capital campaign, Denver was the largest single donor. In 1983 and 1984, Denver hosted the annual Grammy Awards. In the 1983 finale, Denver was joined on stage by folk music legend Joan Baez with whom he led an all-star version of "Blowin' in the Wind" and "Let The Sunshine In," joined by such diverse musical icons as Jennifer Warnes, Donna Summer, and Rick James. In 1984, Roone Arledge, president of ABC Sports, asked Denver to compose and sing the theme song for the 1984 Winter Olympics in Sarajevo. 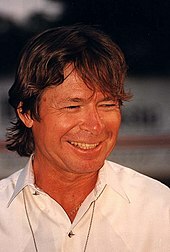 Denver worked as both a performer and a skiing commentator. (Skiing was another avocation of Denver.) He had written and composed "The Gold and Beyond", and he sang it for the Olympic Games athletes, as well as local venues including many schools. In 1985, Denver asked to participate in the singing of "We Are the World," but he was turned down. According to Ken Kragen (who helped to produce the song), the reason Denver was turned down was that many people felt his image would hurt the credibility of the song as a pop-rock anthem. "I didn't agree" with this assessment, Kragen said, but he reluctantly turned Denver down anyway. Due to his love of flying, he was attracted to NASA and became dedicated to America's work in outer space. He conscientiously worked to help bring into being the "Citizens in Space" program. Denver received the NASA Public Service Medal, in 1985 for "helping to increase awareness of space exploration by the peoples of the world", an award usually restricted to spaceflight engineers and designers. Also, in 1985, Denver passed NASA's rigorous physical exam and was in line for a space flight, a finalist for the first citizen's trip on the Space Shuttle in 1986, but he was not chosen. After the Space Shuttle Challenger disaster with teacher Christa McAuliffe aboard, Denver dedicated his song "Flying for Me" to all astronauts, and he continued to support NASA. Denver testified before the Senate Labor and Commerce Committee on the topic of censorship during a Parents Music Resource Center hearing in 1985. Contrary to his innocuous public image as a musician, Denver openly stood with more controversial witnesses like Dee Snider of the heavy metal band Twisted Sister in opposing the PMRC's objectives. For instance, Denver described how he himself was censored for his song, "Rocky Mountain High," for being misconstrued as a drug song. Denver also toured Russia in 1985. His 11 Soviet Union concerts were the first by any American artist in more than 10 years. He returned two years later to perform at a benefit concert for the victims of the Chernobyl disaster. In October 1992, Denver undertook a multiple-city tour of the People's Republic of China. He also released a greatest-hits CD, Homegrown, to raise money for homeless charities. In 1994, he published his autobiography, Take Me Home, in which he candidly spoke of his cannabis, LSD, and cocaine use, his marital infidelities, and his history of domestic violence. In 1996, he was inducted into the Songwriters Hall of Fame. In early 1997, Denver filmed an episode for the Nature series, centering on the natural wonders that inspired many of his best-loved songs. His last song, "Yellowstone, Coming Home", which he composed while rafting along the Colorado River with his son and young daughter, is included. In the summer of 1997, shortly before his death, Denver recorded a children's train album for Sony Wonder, titled All Aboard! This was produced by long-time friend Roger Nichols. The album consisted of old-fashioned swing, big band, folk, bluegrass, and gospel styles of music woven into a theme of railroad songs. This album won a posthumous Best Musical Album For Children Grammy for Denver, which was his only Grammy. Denver's first marriage was to Anne Martell of St. Peter, Minnesota. She was the subject of his hit "Annie's Song", which he composed in only ten minutes as he sat on a Colorado ski lift after the couple had had an argument. They lived in Edina, Minnesota, from 1968 to 1971. Following the success of "Rocky Mountain High", inspired by a camping trip with Anne and some friends, Denver purchased a residence in Aspen, Colorado. He lived in Aspen continuously until his death. The Denvers adopted a boy, Zachary John, and a girl, Anna Kate, who Denver would say were "meant to be" theirs. Denver once said, "I'll tell you the best thing about me. I'm some guy's dad; I'm some little gal's dad. When I die, Zachary John and Anna Kate's father, boy, that's enough for me to be remembered by. That's more than enough". Zachary was the subject of "A Baby Just Like You", a song that included the line "Merry Christmas, little Zachary" and which he wrote for Frank Sinatra. Denver and Martell divorced in 1982. In a 1983 interview shown in the documentary John Denver: Country Boy (2013), Denver said that career demands drove them apart; Anne said that they were too young and immature to deal with John's sudden success. The ensuing property settlement caused Denver to become so enraged, he nearly choked Martell, then used a chainsaw to cut their marital bed in half. In 1993, Denver pleaded guilty to a drunken driving charge, and was placed on probation. In August 1994, while still on probation, he was again charged with misdemeanor driving under the influence after crashing his Porsche into a tree in Aspen. Though a jury trial in July 1997 resulted in a hung jury on the second DUI charge, prosecutors later decided to reopen the case, which was closed only after Denver's accidental death in October 1997. In 1996, the FAA decided that Denver could no longer fly a plane, due to medical disqualification for failure to abstain from alcohol, a condition that the FAA had imposed in October 1995 after his prior drunk-driving conviction. Denver's talent extended beyond music. Artistic interests included painting, but because of his limiting schedule he pursued photography, saying once "photography is a way to communicate a feeling". Denver was also an avid skier and golfer, but his principal interest was in flying. His love of flying was second only to his love of music. In 1974, he bought a Learjet to fly himself to concerts. He was a collector of vintage biplanes, and owned a Christen Eagle aerobatic plane, two Cessna 210 airplanes, and in 1997, an experimental, amateur-built Rutan Long-EZ. Denver was killed on October 12, 1997, when his experimental Rutan Long-EZ plane, aircraft registration number N555JD, crashed into Monterey Bay near Pacific Grove, California, while making a series of touch-and-go landings at the nearby Monterey Peninsula Airport. Denver was the only occupant of the aircraft. Identification was not possible using dental records; only his fingerprints confirmed that the pilot was Denver. The official cause of death was multiple blunt force trauma resulting from the crash. Denver was a pilot with over 2,700 hours of experience. He had pilot ratings for single-engine land and sea, multi-engine land, glider, and instrument. He also held a type rating in his Learjet. He had recently purchased the Long-EZ aircraft, made by someone else from a kit, and had taken a half-hour checkout flight with the aircraft the day before the accident. Denver was not legally permitted to fly at the time of the accident. In previous years, Denver had a number of drunk driving arrests. In 1996, nearly a year before the accident, the Federal Aviation Administration learned that Denver had failed to maintain sobriety by failing to refrain entirely from alcohol, and revoked his medical certification. However, the accident was not influenced by alcohol use, as an autopsy found no sign of alcohol or other drugs in Denver's body. Post-accident investigation by the National Transportation Safety Board (NTSB) showed that the leading cause of the accident was Denver's inability to switch fuel tanks during flight. The quantity of fuel had been depleted during the plane's flight to Monterey and in several brief practice takeoffs and landings Denver performed at the airport immediately prior to the final flight. His newly purchased experimental Rutan had an unusual fuel tank selector valve handle configuration. The selector valve handle had been intended by the plane's designer to be located between the pilot's legs. The builder instead had placed it behind the pilot's left shoulder. The fuel gauge was also placed behind the pilot's seat and not visible to the person at the controls. An NTSB interview with the aircraft mechanic servicing Denver's plane revealed that he and Denver had discussed the inaccessibility of the cockpit fuel selector valve handle and its resistance to being turned. Before the flight, Denver and the mechanic had attempted to extend the reach of the handle, using a pair of Vise-Grip pliers. However, this did not solve the problem, and the pilot still could not reach the handle while strapped into his seat. NTSB investigators' post-accident investigation showed that because of the positioning of the fuel selector valves, switching fuel tanks required the pilot to turn his body 90 degrees to reach the valve. 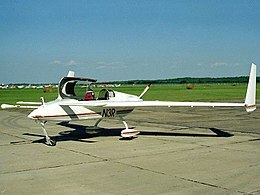 This created a natural tendency to extend one's right foot against the right rudder pedal to support oneself while turning in the seat, which caused the aircraft to yaw (nose right) and pitch up. The mechanic said he had remarked to Denver that the fuel sight gauges were visible only to the rear cockpit occupant. Denver had asked how much fuel was shown. He told Denver there was "less than half in the right tank and less than a quarter in the left tank". He then provided Denver with an inspection mirror so he could look over his shoulder at the fuel gauges. The mirror was later recovered in the wreckage. Denver said he would use the autopilot inflight to hold the airplane level while he turned the fuel selector valve. He turned down an offer to refuel, saying he would be flying for about an hour. The NTSB interviewed 20 witnesses of Denver's last flight. Six of them had seen the plane crash into the bay near Point Pinos. Four witnesses stated the aircraft was originally heading west. Five said they saw the plane in a steep bank, with four of these saying the bank was to the right (north). Twelve witnesses described seeing the aircraft in a steep nose-down descent. Witnesses estimated the plane's altitude to be between 350 and 500 feet (110 and 150 m) when heading toward the shoreline. Eight said that they heard a "pop" or "backfire", accompanied by a reduction in the engine noise level just before the airplane crashed into the sea. In addition to Denver's failing to refuel and his subsequent loss of control, while attempting to switch fuel tanks, the NTSB determined there were other key factors that led to the accident. Foremost among these was Denver's inadequate transition training on this type of aircraft, and the builder's decision to locate the fuel selector handle in a difficult-to-reach location. The board issued recommendations on the requirement and enforcement of mandatory training standards for pilots operating experimental aircraft. It also emphasized the importance of mandatory ease of access to all controls, including fuel selectors and fuel gauges, in all aircraft. Upon announcement of Denver's death, Colorado governor Roy Romer ordered all state flags to be lowered to half-staff in his honor. Funeral services were held at Faith Presbyterian Church in Aurora, Colorado, on October 17, 1997, officiated by Pastor Les Felker, a retired Air Force chaplain, following which Denver's remains were cremated and his ashes were scattered in the Rocky Mountains. Further tributes were made at the following Grammys and Country Music Association Awards. In 2000, CBS presented the television movie Take Me Home: The John Denver Story loosely based on his memoirs, starring Chad Lowe as Denver. The New York Post observed, "An overachiever like John Denver couldn't have been this boring." On September 23, 2007, nearly ten years after Denver's death, his brother Ron witnessed the dedication of a plaque placed near the crash site in Pacific Grove, California, commemorating the singer. Denver's music remains popular around the world. Previously unreleased and unnoticed recordings are now sought-after collectibles in pop, folk and country genres. Also in demand are copies of Denver's many television appearances, especially his one-hour specials from the 1970s and his six-part series for Britain's BBC, The John Denver Show. An anthology musical featuring Denver's music, Back Home Again: A John Denver Holiday, premiered at the Rubicon Theatre Company in November 2006. 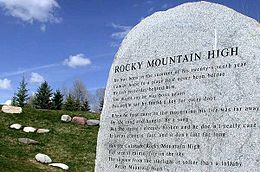 On March 12, 2007, the Colorado Senate passed a resolution to make Denver's trademark 1972 hit "Rocky Mountain High" one of the state's two official state songs, sharing duties with its predecessor, "Where the Columbines Grow". The resolution passed 50–11 in the House, defeating an objection by Rep. Debbie Stafford (R-Aurora) that the song reflected drug use, most specifically the line, "friends around the campfire and everybody's high". Sen. Bob Hagedorn, the Aurora Democrat who sponsored the proposal, defended the song as nothing to do with drugs, but everything to do with sharing with friends the euphoria of experiencing the beauty of Colorado's mountain vistas. Nancy Todd (D-Aurora) said that "John Denver to me is an icon of what Colorado is." On September 24, 2007, the California Friends of John Denver and The Windstar Foundation unveiled a bronze plaque near the spot where his plane went down near Pacific Grove. The site had been marked by a driftwood log carved (by Jeffrey Pine of Colorado) with the singer's name, but fears that the memorial could be washed out to sea sparked the campaign for a more permanent memorial. Initially, the Pacific Grove Council denied permission for the memorial, fearing the place would attract ghoulish curiosity from extreme fans. Permission was finally granted in 1999, but the project was put on hold at the request of the singer's family. Eventually, over 100 friends and family attended the dedication of the plaque, which features a bas-relief of the singer's face and lines from his song "Windsong": "So welcome the wind and the wisdom she offers. Follow her summons when she calls again." To mark the 10th anniversary of Denver's death, his family released a set of previously unreleased recordings of Denver's 1985 concert performances in the Soviet Union. This two-CD set, John Denver – Live in the USSR, was produced by Denver's friend Roger Nichols, and released by AAO Music. These digital recordings were made during 11 concerts and then rediscovered in 2002. Included in this set is a previously unpublished rendition of "Annie's Song" in Russian. The collection was released November 6, 2007. On October 13, 2009, a DVD box set of previously unreleased concerts recorded throughout Denver's career was released by Eagle Rock Entertainment. Around the World Live is a 5-disc DVD set featuring three complete live performances with full band from Australia in 1977, Japan in 1981, and England in 1986. These are complemented by a solo acoustic performance from Japan in 1984, and performances at Farm Aid from 1985, 1987, and 1990. The final disc has two-hour-long documentaries made by Denver. On April 21, 2011, Denver became the first inductee into the Colorado Music Hall of Fame. A benefit concert was held at Broomfield's 1stBank Center and hosted by Olivia Newton-John. Other performers participating in the event included the Nitty Gritty Dirt Band, Lee Ann Womack, and John Oates. Both of his ex-wives were in attendance, and the award was presented to his three children. The John Denver "Spirit" statue is a 2002 bronze sculpture statue by artist Sue DiCicco that was financed by Denver's fans. It is located at the Colorado Music Hall of Fame at Red Rocks. On March 7, 2014, the West Virginia Legislature approved a resolution to make "Take Me Home, Country Roads" the official state song of West Virginia. Governor Earl Ray Tomblin signed the resolution into law on March 8. On October 24, 2014, Denver was awarded a star on the Hollywood Walk of Fame in Hollywood, California. Denver began his recording career with a group that had started as the Chad Mitchell Trio; his distinctive voice can be heard where he sings solo on "Violets of Dawn", among other songs. He recorded three albums with the Mitchell Trio, replacing Chad Mitchell himself as high tenor. The group Denver, Boise, and Johnson, which had evolved from the Mitchell Trio, released a single before he moved on to a solo career. Bill Danoff and Taffy Nivert, credited as co-writers of Denver's song "Take Me Home, Country Roads", were close friends of Denver and his family, appearing as singers and songwriters on many of Denver's albums until they formed the Starland Vocal Band in 1976. The band's albums were released on Denver's Windsong Records (later known as Windstar Records) label. Denver's solo recording contract resulted in part from the recording by Peter, Paul, and Mary of his song "Leaving on a Jet Plane", which became the sole number-1 hit single for the group. Denver recorded songs by Tom Paxton, Eric Andersen, John Prine, David Mallett, and many others in the folk scene. His record company, Windstar, is still an active record label today. Country singer John Berry considers Denver the greatest influence on his own music and has recorded Denver's hit "Annie's Song" with the original arrangement. Olivia Newton-John, an Australian singer whose across-the-board appeal to pop, MOR, and country audiences in the mid-1970s was similar to Denver's, lent her distinctive backup vocals to Denver's 1975 single "Fly Away"; she performed the song with Denver on his 1975 Rocky Mountain Christmas special. She also covered his "Take Me Home, Country Roads", and had a hit in the United Kingdom (#15 in 1973) and Japan (#6 in a belated 1976 release) with it. In 1976, Denver and Newton-John appeared as guest stars on The Carpenters' Very First Television Special, a one-hour TV special broadcast on the ABC television network. ^ Sterling, Christopher H.; O'Dell, Cary (April 12, 2010). "The Concise Encyclopedia of American Radio". Routledge – via Google Books. ^ "The Music of John Denver – Songs, Reviews, Credits". AllMusic. ^ "John Denver Biography – life, family, children, name, death, wife, young, son, born". Notablebiographies.com. Retrieved August 25, 2015. ^ Maphis, Susan. "10 Best Selling Artists of the 1970s". mademan.com. Archived from the original on May 21, 2012. Retrieved May 16, 2012. ^ Ankeny, Jason. "John Denver Biography". AllMusic. Retrieved June 4, 2014. ^ "John Denver, A Rocky Mountain High Concert". The Florida Theatre. November 19, 2013. Retrieved August 25, 2015. ^ "''Ancestry of John Denver'' compiled by William Addams Reitwiesner". Wargs.Com. Retrieved May 9, 2011. ^ "John Denver's Genealogy Road Leads to Oklahoma, Not Colorado". Recordclick.com. Retrieved June 1, 2018. ^ Plett, Rowena. "John Denver Had Mennonite Ancestors." Hillsboro Star-Journal. January 19, 2011. Retrieved 2017-09-19. ^ "John Denver". The Daily Telegraph. London. October 14, 1997. ^ "FindArticles biodata". Findarticles.com. 2002. Archived from the original on July 8, 2012. Retrieved May 9, 2011. ^ a b c d e f "Biography". john denver. Retrieved August 17, 2010. ^ a b "The New Christy Minstrels". Thenewchristyminstrels.com. Retrieved August 17, 2010. 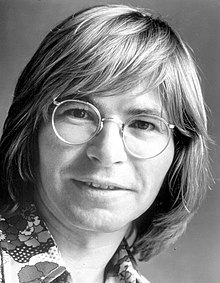 ^ a b c d e f g h "John Denver Biography – life, family, children, name, death, wife, young, son, born, college, contract, marriage, year, Raised in Military Family". Notablebiographies.com. Retrieved August 17, 2010. ^ University, Texas Tech (1964). "La Ventana, vol. 039". ^ Ruhlman, William (April 12, 1996). "Beginnings". Goldmine Magazine. Retrieved January 24, 2010. ^ "Top 100 Music Hits, Top 100 Music Charts, Top 100 Songs & The Hot 100". Billboard. Retrieved August 17, 2010. ^ "Artist Biography – John Denver". Countrypolitan.com. October 12, 1997. Archived from the original on February 21, 2001. Retrieved May 9, 2011. ^ "Private Tutor". Infoplease.com. Retrieved August 17, 2010. ^ Take Me Home: An Autobiography, John Denver and Arthur Tobier, Harmony Books, 1994. ^ "John Denver: Biography from". Answers.com. Retrieved May 9, 2011. ^ "The Greatest : Features". CMT.com. April 3, 1992. Archived from the original on March 20, 2012. Retrieved August 10, 2018. ^ thepiperchile. "ABBA on TV – Music for UNICEF – A Gift of Song Concert". Abbaontv.com. Archived from the original on July 7, 2011. Retrieved May 9, 2011. ^ a b Isenberg, Barbara (August 20, 1979). "Aspen Takes a Mellow Stance Towards John Denver's Gas Tank". The Record. Los Angeles Times News Service. Retrieved December 18, 2018. ^ "Harry Chapin". Harrychapin.com. Retrieved May 9, 2011. ^ Denver, John. "John Denver: Senate Statement on Rock Lyrics & Record Labeling". American Rhetoric. Retrieved January 26, 2019. ^ a b "Windstar Foundation announcement". Wstar.Com. September 11, 2007. Archived from the original on June 15, 2011. Retrieved May 9, 2011. ^ "John Denver – Let this be a voice". Pbs.org Nature. Retrieved May 9, 2011. ^ "Roger Nichols". The Daily Telegraph. London. June 16, 2011. ^ "John Denver". Rock on the Net. Retrieved May 9, 2011. ^ Martin, Frank W. (February 26, 1979). "John Denver's Unsung Story". People. Meredith Corporation. Retrieved August 15, 2018. ^ "John Denver". Midtod.com. October 5, 1997. Retrieved August 25, 2015. ^ Martin, Frank W. "John Denver's Unsung Story", People, February 26, 1979. ^ "Cassandra Delaney Biography". Internet Movie Database. Retrieved July 8, 2014. ^ a b Castro, Peter. "Peaks & Valleys", People, October 27, 1997. ^ a b "Closeup: The John Denver Crash". Avweb.com. Archived from the original on February 11, 2010. Retrieved May 9, 2011. ^ "Archive : Vault : Death Certificates: John Denver". Rockmine. Retrieved August 25, 2015. ^ Press, From Associated (June 23, 1998). "John Denver Plane Crash Inquiry Ends" – via LA Times. ^ "Denver's Long-EZ". Check-six.com. Retrieved August 25, 2015. ^ National Transportation Safety Board (NTSB). "Press release". Retrieved December 7, 2009. ^ Coile, Zachary; Gurnon, Emily; Hatfield, Larry D. (October 13, 1997). "John Denver dies in crash". SFGate. Retrieved September 26, 2016. ^ Buckman, Adam. "Home Movie Disses Denver", New York Post, April 29, 2000. ^ "John Denver and Friends Rocky Mountain High". Shellworld.net. April 17, 2009. Retrieved May 9, 2011. ^ "Colorado State Song Rocky Mountain High composed by John Denver". Netstate.com. Retrieved August 25, 2015. ^ "John Denver Sanctuary, Aspen, Colorado". Aspenportrait.com. October 12, 1997. Retrieved May 9, 2011. ^ "John Denver Memorial Plaque Pacific Grove". Johndenverclub.org. Retrieved May 9, 2011. ^ Baskin, Gregory (October 16, 2014). "John Denver To Get Posthumous Star on Hollywood Walk of Fame [Video]". Guardian Liberty Voice. Retrieved October 18, 2014. ^ Kroll, David (December 31, 2010). "John Denver, friend of science, born today in 1943 | Take As Directed". Take As Directed. PLOS. Retrieved June 17, 2018.